turmeric (Curcuma longa) is one of the most powerful natural healers. the active constituent of turmeric is curcumin. curcumin is a polyphenol with powerful antioxidant and anti-inflammatory properties. polyphenols have the ability to stabilize free radicals, which can damage the body’s cells. if you suffer from arthritis, back pain or any kind of joint pain, it helps reduce the inflammation by reducing histamine levels. curcumin lowers the levels of two enzymes in the body that cause inflammation. 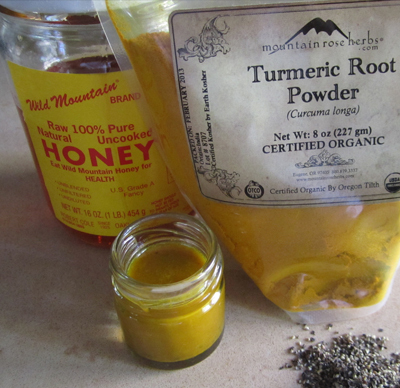 here is a recipe i use for making a turmeric syrup. adding black pepper to turmeric enhances curcumin's bioavailability by 1,000 times due to black pepper's hot property called piperine. honey has antibacterial and anti-inflammatory properties. warm up some honey in a pan. the amount of honey is dependent on how sweet you want it. i add a little water to thin the honey down. add in the turmeric and pepper and mix thoroughly. stir slowly until all the powder is dissolved. i put it into a used wine bottle and keep it in the fridge and take a small shot of it everyday. proportions are not critical as this is a food grade herb. turmeric is extremely safe. it has been used in large quantities as a food, with no adverse reactions. but, if you are taking certain medications for blood thinning or stomach acid reducers, you should talk to your doctor first before using curcumin for medicinal purposes because there might be adverse reactions. i got my first bee sting a few hours ago. i had heard about using plantain (Platago major)... pick a leaf, chew it up to release it's juices, and apply it to the sting. almost immediately, the pain subsided - the stinging stopped - the swelling went down. you can keep it in place with a band-aid. 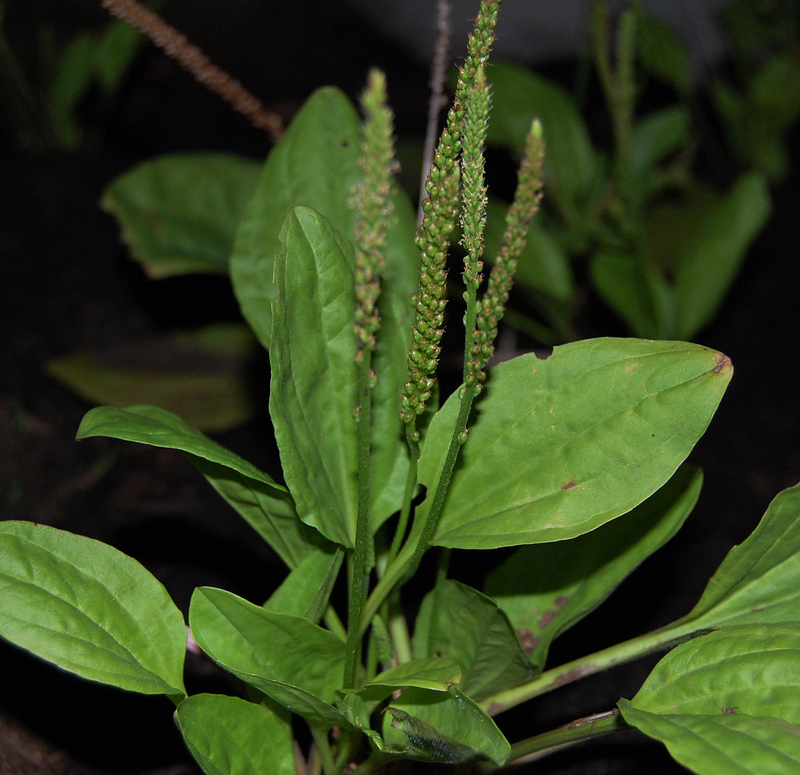 plantain is known to have amazing drawing power. it pulls out poison and draws out infection. it can also be used for cuts or scapes since it has a lot of value in calming skin conditions. 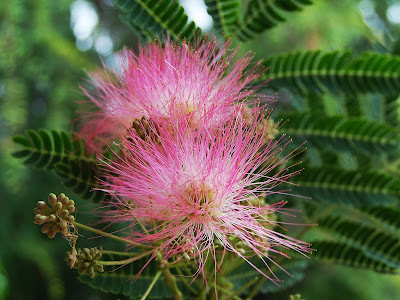 maybe you have seen it growing around your yard or neighborhood... most people think of it as a 'weed' - but it is not. i am happy to have this 'weed' growing in my yard. the mimosa (Albizia julibrissin) is in full bloom with it's bright pink puffs. it has been around for as long as i can remember - but i just learned about it's medicine today. i gathered some flowers and cut up some bark and started a tincture. put them all in jar, cover with alcohol - shake it up occasionally - and it will sit for 4 to 6 weeks. then strain the plant material. it is used as a relaxant nervine and uplifting mood effects. the flower is considered to be one of the best "shen tonics" in traditional chinese medicine. shen means spirit/heart - the spirit of the person, that lives in the heart. disturbed shen can result in anxiety, insomnia, feelings of great grief, broken heartedness and generally disturbed emotional state. 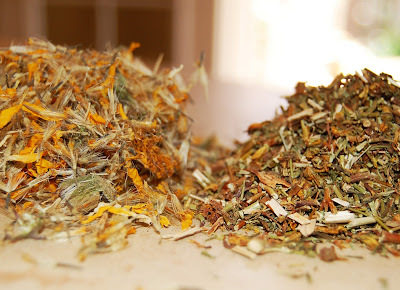 i just got my package from mountain rose herbs (mountainroseherbs.com) of arnica (Arnica montana) and st. john's wort (Hypericum perforatum). i am infusing them both in olive oil - and then i will make a salve. use the oil of st. john's wort for relieving pain and injuries to nerves. it can also ease the pain of sunburn. i read somewhere - that the medicinal properties actually soak into the skin and help lessen the pain from nerve injuries. i have been wanting to make this rose (Rosa spp.) elixer for a while. 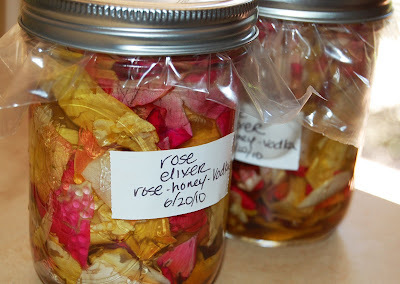 with enough fresh wild rose petals to fill the jar with everclear, vodka or brandy, and raw honey. fill the jar with whole or roughly chopped rose petals. 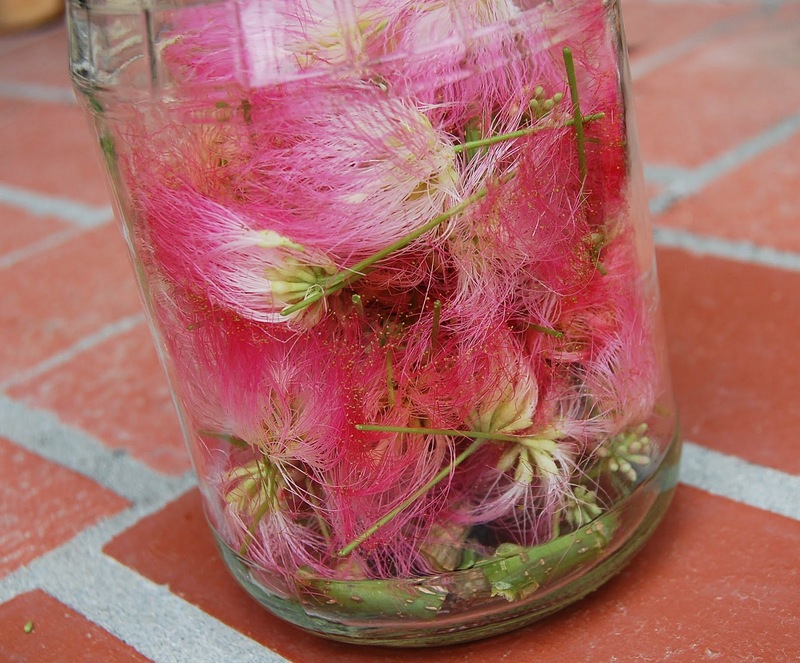 add raw honey to coat the petals - about 1/4 of the jar - then fill with alcohol. cover the top with plastic before screwing on a regular canning lid. if you skip the plastic, your elixir will eventually start corroding the metal lid. i used plastic sandwich bags. shake well. let sit for three to six weeks, shaking regularly. you can strain at the end of that time or you can just pour off the amount you want to use a little at a time. use this externally on burns and wounds. it has the ability to eradicate the pain of burns very quickly and to dramatically speed healing. the honey helps to hold the elixir in place on the skin and contributes to the soothing effect. 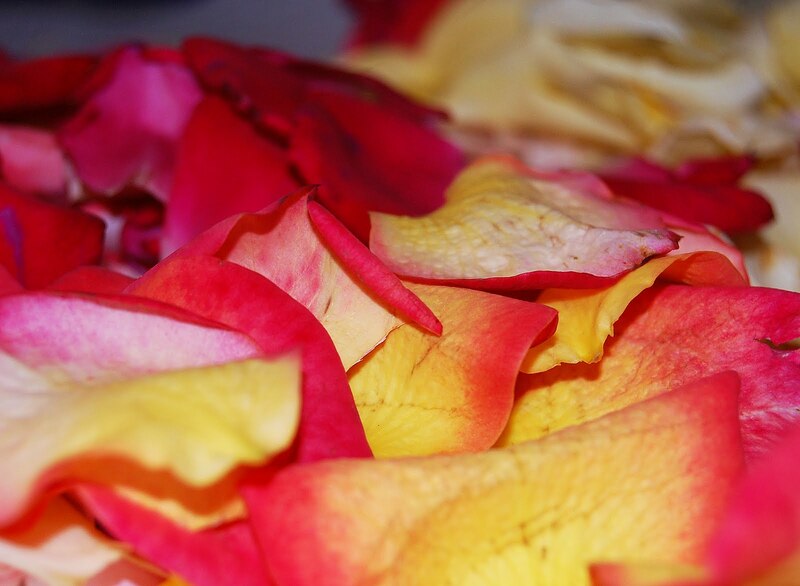 rose is blood moving, which helps pain relief and quicker healing. it is also anti-inflammatory, anti-bacterial and astringent, which helps reduce redness, swelling and any possible infection. a drop or two will calm the itch from an insect bite. it also helps rashes from heat, dermatitis, blisters or poison ivy. it can be used as a liniment (a medicinal liquid that is rubbed into the skin to relieve muscular stiffness and pain) for relaxing sore muscles, and for sharp, shooting sensations related to nerve pain or slipped discs. internally it is used for any trauma, panic, fear or stressful situation for child, adult or animal. it’s calming, pleasant and blood moving, helping to move someone out of a paralyzing shock or stuck emotion. it acts as a mild nervine, calming without sedating and restoring emotional equilibrium. i am starting to get a deeper understanding into herbal medicine and herbal energetics. each herb has a different taste (bitter, sweet, salty, sour, spicy) temperature (hot, cold) and humidity (drying, moisturizing). once i determine the energetics - i can then look up to see what the action is. a few herbal actions are: demulcents (act as a protective barrier on inflamed or irritated tissue) sedatives (sedates and strengthens the nervous system) alteratives (promote detoxification, stimulate digestive organs) immune enhancers (help the body fight infection)... these a just a few herbal actions. so by knowing what the energetics and actions are... and by knowing what the physical dis-ease is - you can then match the plant to the person. it is also important to know what a persons consitution is. one of my plants to journal on was valerian (Valeriana officinalis) and i learned a hard lesson. valerian is known to be a sedative. i prepared my valerian as a decoction and sipped it before i went to bed - knowing it would make me sleepy and relaxed. i got into bed around 11:00pm.... then it was 1:00... then 3:00. i could not fall asleep - i was figgity and aggitated. the next morning i did some research and found out that since valerian is a warming herb - it works well for people with a 'cold' constitution to promote sleep - but it can have the exact opposite effect on someone with a 'warm' constitution - it can keep them up all night ! it can actually aggravate the system in an already over heated individual. so... i guess i have a 'warm' constitution. i am going to be reading more on energetics, actions and constitutions - and how important these three aspects are. the fda has many biases in determining the effectiveness of herbs. although the fda fails to reach opinions on the safety of many herbs based on what they consider to be a lack of verifiable scientific studies, the truth is that many accredited studies on herbs do exist. check with an herbalist - think about what you put in your body and any potential interactions and side affects. do the research before making decisions which affect your health and well being. you are the most important part of insuring your health. content and images © 2013 tierra natural skin care. Powered by Blogger.